Secluded gardens, fantastic pools, romantic settings, luxurious spa treatments, exclusive golf, exquisite dining—you can find everything you need to relax at a Phoenix resort. Why invest in airport transportation, airline tickets, a rental car, and time wasted at airports, when you can vacation in your own backyard? If the resort offers package deals, some might include spa treatments, golf, or treats to enhance the romance in your life. These package deals are designed especially for locals who want to get away from it all but only have a day or two to spare. But even if the hotel is not offering specific packages, the prices in the summer are low because the temperature in Phoenix is high and it's the low tourist season. If you're visiting the Phoenix area in the summer despite the heat, you can cash in on these great deals. The Royal Palms Resort and Spa prides itself on the non-commercial feel of the resort. It's designed for romance, and there are many lush secluded areas. Rooms and casitas have designer touches and artistic details, and spa treatments are designed for two. The resort has a Spanish Colonial-Mediterranean ambiance. ​T. Cook's offers the resort's premiere dining experience. Referred to as the "Jewel of the Desert," the Frank Lloyd Wright-designed architecture of the Arizona Biltmore is unique. 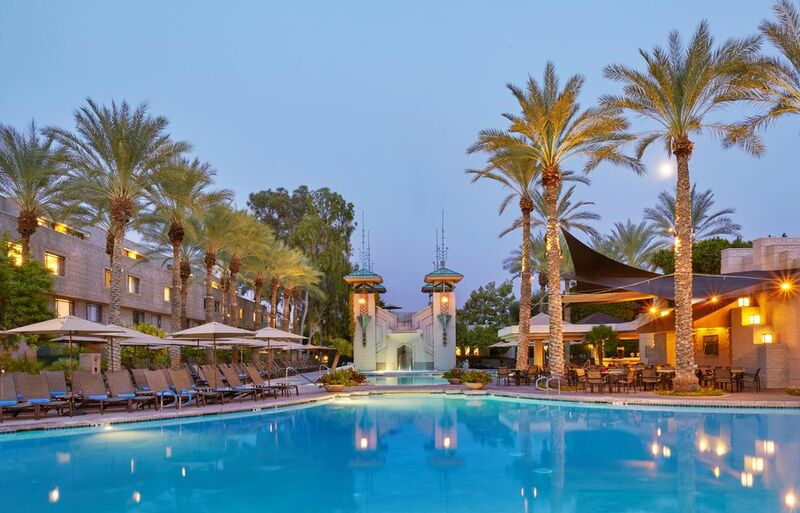 Forget that you are right in the heart of central Phoenix as you enjoy the luxurious gardens, dining, and accommodations at the Arizona Biltmore. Tennis, golf, and eight pools are at the ready. During the summer, planned activities entice families. Wright's at the Biltmore offers the resort's premier dining experience. The Paradise Pool, with its three pools in one and 92-foot waterslide, is the hub of the summer scene with poolside fun, poolside dining, and ​dive-in movies to watch. The 15 cabanas feature a spacious and comfortable indoor sitting area with HDTV and full bath, private patio area with chaise lounges and table and chairs, and special food and beverage service. Four other pools provide a more relaxing, quieter pool experience. Live music at Wright's Bar, wine tastings, kids' cooking classes, and nighttime glow golf are just a few of the summertime activities that await you at The Biltmore. The Biltmore's summer all-inclusive package includes your room, breakfast, lunch, and dinner, along with a spa discount. This luxury boutique hotel is nestled in a residential area in one of the Phoenix area's most exclusive neighborhoods, Paradise Valley. The resort provides a true Southwest experience, with Arizona-themed decor, garden settings, and casitas with private patios. LON's at the Hermosa is a first-class dining experience. Known for its superior cuisine and exemplary wine list, it is also a favorite spot for dining alfresco. You won't find a water park or kids camps here; think more quiet getaway for pampering, fine food, and fine wines. If you're looking for a romantic summer weekend, this is a prime choice. The Hermosa Inn offers a Summer in Paradise getaway package which includes accommodations, welcome cocktails, daily food credit, daily poolside treats, and late check-in and early arrival privileges. The award-winning Sheraton Grand at Wild Horse Pass is located on the Gila River Indian Community near Chandler. Unique in its concept, the resort is proud to showcase the heritage, culture, art, and legends of the Pima and Maricopa tribes. The guest rooms are culturally themed. After enjoying one of the two golf courses at Whirlwind Golf Club or a ride at the Koli Equestrian Center, relax and be transformed at Aji Spa. You might even actually see the wild horses for which the resort is named from the patio at the nationally acclaimed Kai Restaurant, the top dining experience here. If you book early, you'll snag some great summer rates. In the heart of Downtown Tempe, you'll find a full-service hotel within walking distance of more than 100 restaurants, bars, and shops in the Mill Avenue District. If that isn't enough for you, this hotel is about a five-minute walk from a Valley Metro Rail station, allowing you to explore other parts of Tempe, Mesa, and Phoenix. Tempe Mission Palms is part of the Destination Hotels collection of luxury and upscale independent hotels, resorts, and residences across the United States. 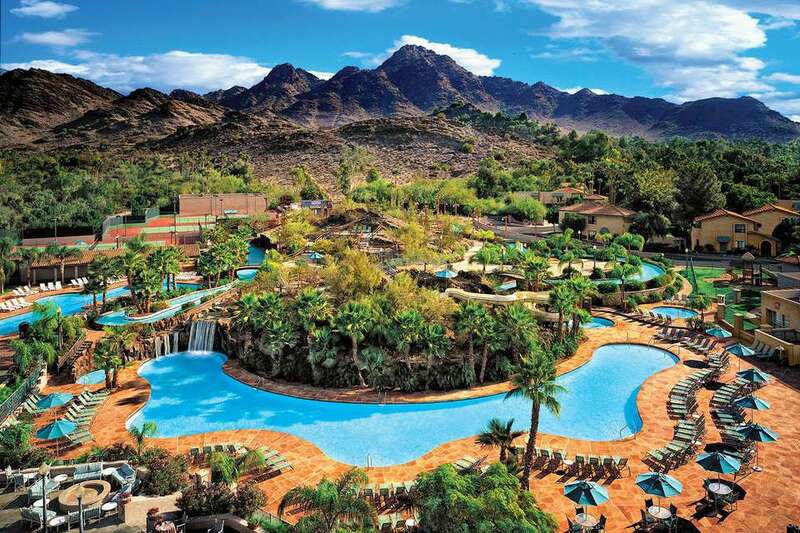 The award-winning JW Marriott Desert Ridge Resort & Spa is in North Phoenix, right next to Scottsdale. You may never want to leave your large, bright room, which is inspired by the textures and colors of the Sonoran Desert. But wait, you must leave, or you'll miss out on seven different dining experiences, from casual to posh; the two 18-hole Wildfire golf courses just steps away from the lobby; four acres of pools, including waterslide and 1,600-linear-foot lazy river; a tennis center; full-service spa; and the Family Escape Club for all-day entertainment for the kids. Sanctuary Camelback Mountain is an award-winning resort where luxury coexists with a secluded escape from the rush and crowds. It isn't unusual to find celebrities spending their time at Sanctuary, enjoying Asian-inspired spa services, lounging by the pool, or meeting friends at Jade Bar. Sanctuary has a long list of packages that include Spa Harmony, Bed and Breakfast, Sanctuary Escape, Romance in Paradise, Three Nights or More, Women's Recharge Retreat, and Advance Purchase. There are two Pointe Hilton Resorts, both of which are in Central Phoenix. Pointe Hilton Squaw Peak Resort is a bit off the beaten path, on 16th Street between Glendale and Northern. Pointe Hilton Tapatio Cliffs Resort is on Seventh Street, south of Thunderbird, and is in the middle of the North Mountain Preserve. Both are Spanish-Mediterranean-designed, and all their accommodations are suites. Dive-in movies, poolside games, arts and crafts, cooking lessons with the chefs, and milkshake parties are samples of some of the summer activities that usually take place. The Wigwam, an award-winning resort in Litchfield Park, west of Phoenix, surrounds guests with the quiet, natural beauty of the desert Southwest. Arizona's largest golf resort is home to 54 championship holes. The state-of-the-art Red Door Spa is located on the property, which spans 500 acres, and there are pool areas for both quiet relaxation and splashdown fun.